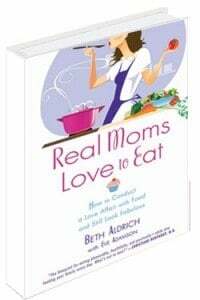 If any of you out there can relate, you will want to grab a copy of Beth Aldrich’s, Real Moms Love to Eat. She has taken all of the quirks that make us women/moms tick and has written a book on practical,do not beat yourself up, advice. Real Moms Love to Eat is not a hoax. There are some very solid principles for healthy eating in this book, but most important there is a ton of empathy and logical everyday advice that can help anyone struggling with their weight. In this book, I really got the feel that Beth is trying to talk to her readers’ one on one. If you can open your heart and mind and adopt a love for yourself and a sincere desire to make a healthier you, this book is going to be your best friend. There is a fabulous website that coincides with the book and it is full of practical advice for everyone, not just moms. Be sure to visit the Real Moms Love to Eat website too.